Two goals from Lukas Podolski on each side of the half at Craven Cottage and an opener from Oliver Giroud gave the gunners a 3-1 victory over Fulham. The gunners fielded a makeshift defence with RB Sagna playing at CB without Kos D’Boss. The defence held sway till the 78the minute before Bent scored a consolation. On a wet saturday afternoon, Aaron Ramsey’s shot got cut up in Giroud’s feet and the Frenchman was quick enough to direct the ball into the net to get his 3rd goal in three games for the gunners this season. What a way to mark your 50th game for the club – scoring your 20th goal; what a way to respond to all the criticism from the press. HE indeed is poised for a better second season. Szczesny would keep Arsenal afloat with a double later on as Fulham seemed to opt their play and try to sting the gunners but the gunners were dreadful on the counter. One of such counter attack resulted in the second goal. A through ball to Walcott by Cazorla, a shot by the englishman, punched away by the Fulham goalie into the part of Podolski. The German sent a wizzling shot into the roof of the net as expected. In last season’s UEFA champions league, Lukas Podolski had a 100% conversion ratio with 4 goals from 4 shots. Podolski whould have doubled the lead before the break but he opted for a low cross instead of a shot. Gibbs also had a chance to kill off the game but it wasnt to be as the half ended 2-0 in favour of the North Londoners. 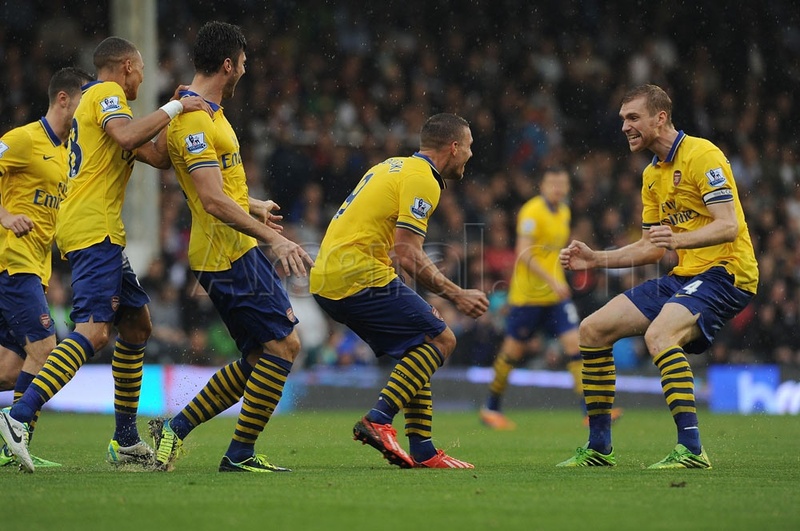 Arsenal rounded up the second half with another Podolski goal in the 68th minute. Fulham were pressing the gunners, a defensive clearance was controlled superbly by Oliver Giroud who gave the ball to Walcott. The young Englishman laid the ball to the Magician Cazorla who danced in the box and laid the ball for the Prince to wizzle through to the net. point, set and match. Wilshere later came in for his 100th Arsenal game and Yaya Sanogo made his competitive debut for the gunners. Yaya sanogo made no impact in the game and I hope to see him play for 45 minutes for me torate him. if I am to rate for the 15 minutes he played, then he isnt worth wearing the Arsenal jersey. but who am i? Darren Bent gave Fulham a consolation after Szczesny’s save fell to his path, but the gunners held on to their 100th London derby win, the highest by any team in London. we paid Fulham in Aston Villa coins. The Arsenal has responded to their opening day defeat at the emirates to Aston Villa but the arrival of new signings would confirm the readiness to challenge for Silverware this season. Our footballing focus would shift to the Fenerbahce visit on Tuesday as we cement our place in the group stages. Maybe the young boys would play but Wenger says he wont rest any players. Till Tuesday. Enjoy the win.